Usually my prompts are fantasy fun inspired... but not today. Today I open myself to a darker image... and a darker thought. Trick or treat? Would you follow this woman into the dark woods? What if she promised to make your deepest wish come true? Or answer your darkest desire... could you resist the temptation? Title: The Secret Sisters Club (Ginnie West Adventures, Book 1) | Author: Monique Bucheger | Illustrator: Mikey Brooks | Publication Date: March 18, 2012 | Publisher: True West Publishing | Pages: 238 | Recommended Ages: 8 to 13 Book Summary: Twelve-year-old BFFs want to be sisters. Tillie's divorced mom plus Ginnie's widowed dad could equal a lifetime of round-the-clock girl talk. Too bad Dad vowed to never marry again. Ginnie and Tillie come up with the perfect mission to change his mind: ‘Operation Secret Sisters.’ Before long, Ginnie suspects Tillie has turned ‘Operation Secret Sisters’ into a scam called ‘Operation Steal My Dad.’ Things get more complicated when Ginnie stumbles across her dead mom’s hidden journals. Ginnie can finally get to know the mother she doesn’t remember and Dad doesn’t talk about … until Dad takes the journals away. Title: Trouble Blows West (Ginnie West Adventures, Book 2) | Author: Monique Bucheger | Illustrator: Mikey Brooks | Publication Date: April 13, 2012 | Publisher: True West Publishing | Pages: 234 | Recommended Ages: 8 to 13 Book Summary: Putting her body in motion before her brain is in gear creates a mountain of problems for 12 year-old Ginnie West. Ginnie is certain that defending her twin brother from the biggest bully in sixth grade was the right thing to do, but she soon finds out she couldn’t be more wrong. Bullies don’t like being embarrassed by girls at school—especially when they are being abused at home. When Ginnie figures out Pierce’s awful secret, she switches gears and decides to be his ally, because he won’t let her be his friend. Title: Simply West of Heaven (Ginnie West Adventures, Book 3) | Author: Monique Bucheger | Illustrator: Mikey Brooks | Publication Date: January 1, 2013 | Publisher: True West Publishing | Pages: 288 | Recommended Ages: 8 to 13 Book Summary: Twelve-year-old BFFs are matchmaking geniuses. They schemed to get Ginnie’s widowed dad to fall in love with Tillie’s divorced mom. Then Ginnie stumbled upon her late mom's journals, making life totally awesome sauce … until her dad confiscated the journals. Ginnie is counting on Tillie's help to make Dad change his mind, but Tillie's not sure the ghost of Ginnie's mom will make a good addition to their new family tree. When a blast from the past shows up and makes Tillie go nutburgers, Ginnie is torn between helping her BFF and having her questions answered. Title: Ten Thankful Turkeys | Author: Angela Muse | Illustrator: Ewa Powdles | Publication Date: October 4, 2014 | Publisher: 4EYESBOOKS | Pages: 32 | Recommended Ages: 2 to 8 Summary: This colorful autumn tale follows ten turkeys as they get ready for an important celebration. This story teaches about gratitude. There are also fun turkey facts in the back of the book. Angela Muse was born in California to a military family. This meant that she got used to being the "new kid" in school every couple of years. It was hard trying to make new friends, but Angela discovered she had a knack for writing. In high school Angela began writing poetry and song lyrics. Expressing herself through writing seemed very natural. After becoming a Mom in 2003, Angela continued her storytelling to her own children. In 2009 she wrote and published her first rhyming children's book aimed at toddlers. Since then she has released several more children's picture books and released books in her first young adult romance series, The Alpha Girls, in 2013/2014. Her husband, Ben Muse writes suspense/thriller books that can also be found on Amazon. Andy, now twelve, discovers more than he bargained for when his parents reveal his mom’s past and he realizes she will die when he breaks the curse unless he intervenes. "A long-lasting story that is part of one of my favorite series." Andy Smithson: Blast of the Dragon’s Fury is FREE. Pick up a copy at Smashwords, Kobo, Google, B&N. You can also listen to the FREE podcast of Book 1 on iTunes. Book one is also available in paperback. Andy Smithson: Venom of the Serpent’s Cunning is available in Kindle and Paperback. Jack Templar and the Lord of the Werewolves Fresh from confronting the Lord of the Vampires in the limestone catacombs beneath Paris, Jack Templar faces his toughest challenge yet as he searches for the next Jerusalem Stone, this one being held by the Lord of the Werewolves. But the narrow escape from the vampire lair came at a great cost and Eva battles to survive the new vampire blood in her veins. The only chance to help Eva is to continue their quest and find the Jerusalem Stones. Reuniting the Stones will not only stop Ren Lucre’s coming war against mankind, but also transform Eva back into her human self. From the ruins of ancient Delhi to the depths of the Black Forest in Germany, Jack and his friends face monsters, bewildering riddles and treachery from the most unlikely of places. Through it all, they are plagued by the Oracle’s prediction that at least one of their group with not make it through the adventure alive. Worse yet, they know that Kaeden, the Lord of the Werewolves, will do his best to make sure none of them do. But they are monster hunters of the Black Guard… and they will do their duty, come what may. Book Blast Giveaway $50 Amazon Gift Card or Paypal Cash Ends 11/4/14 Open only to those who can legally enter, receive and use an Amazon.com Gift Code or Paypal Cash. Winning Entry will be verified prior to prize being awarded. No purchase necessary. You must be 18 or older to enter or have your parent enter for you. The winner will be chosen by rafflecopter and announced here as well as emailed and will have 48 hours to respond or a new winner will be chosen. This giveaway is in no way associated with Facebook, Twitter, Rafflecopter or any other entity unless otherwise specified. The number of eligible entries received determines the odds of winning. Giveaway was organized by Kathy from I Am A Reader and sponsored by the author. VOID WHERE PROHIBITED BY LAW. Along Came a Wolf is the debut book of the highly rated emergent Steampunk series, The Yellow Hoods. This young adult series is layered for the mature reader. It incorporates some elements of fairy-tale, inspired by the notion of what if the rhymes and tales we know were based on real events, in this world. Seeds of a technological revolution have started to sprout in this old world, about to change it forever. A secret society, long thought crushed, makes its first move against its unsuspecting, benevolent opponent. Master inventor Nikolas Klaus has seen some of this coming, and has quietly broken the rule of keeping his secret society's knowledge and skills from the younger generations. He knows that the day will come when they will be needed, but has underestimated how soon. Tee, Elly, and Richy shed their innocence and are forced to stand as the Yellow Hoods to overcome life- threatening dangers unleashed as secrets of Nikolas' past are revealed. Will Nikolas' secrets cost him the life of his granddaughter? Are his efforts too little, too late? "A gripping read. Lots of fun for kids and adults both. A wonderful mixture of action, mystery, and whimsy that leaves an impression on you long after you've turned the last page." "I was always envious of people who could get drawn into a good book. Now, I am one of those people." "This book is well written and the character development is phenomenal. I'm not just talking about the main characters here—I mean ALL of them." In an act of desperation, inventor Maxwell Watt sends his teenage son to Nikolas Klaus with the secret plans for his steam engine. The Fare, a nefarious secret society, learns of the game-changing invention and accelerate their timeline to neutralize Klaus and reclaim control over the kingdoms. While wars spark to the south, children in Mineau have started to go missing—again. Captain Archambault suspects the return of the Ginger Lady. With the help of the Yellow Hoods and their friends, the search is on to find the missing children before it is too late. What is the secret that ties the Yellow Hoods to the Ginger Lady? Who are the Red Hoods really? Enjoy this darker, edgier instalment in this exciting Emergent Steampunk adventure series that is laced with elements of fairy-tale that gives it depth. A young adult series that is layered for the mature reader. Adam Dreece wrote short stories for friends and family, for 25 years. After becoming seriously ill, he decided to make some changes, including never missing a night of reading stories to his kids again because of work, and going after his dream of being an author. He spent three years writing a memoir about his life up to and through that event. With that out of the way, he felt free and able to start writing fiction again. With a nudge from his daughter, he wrote Along Came a Wolf and created The Yellow Hoods series. Adam spends time with his kids, his wife and helping others with their writing online. He's also a public speaker and mentor. He lives in Calgary, Alberta, Canada. 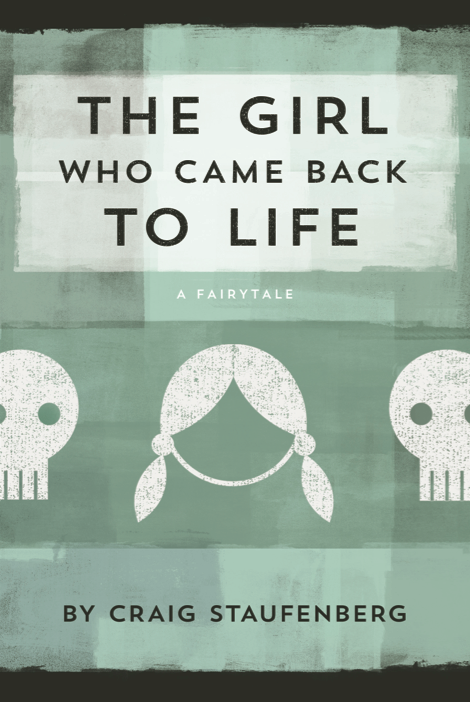 The Girl Who Came Back to Life is a Middle Grade Fantasy (fable/fairytale) and the tour runs October 13-17 with reviews only. Check out thetour page for the full schedule. When you die, your spirit wakes in the north, in the City of the Dead. There, you wander the cold until one of your living loved ones finds you, says "Goodbye," and Sends you to the next world. After her parents die, 12-year-old Sophie refuses to release their spirits. Instead, she resolves to travel to the City of the Dead to bring her mother and father’s spirits back home with her. Taking the long pilgrimage north with her gruff & distant grandmother—by train, by foot, by boat; over ruined mountains and plains and oceans—Sophie struggles to return what death stole from her. Yet the journey offers her many hard, unexpected lessons—what to hold on to, when to let go, and who she must truly bring back to life. 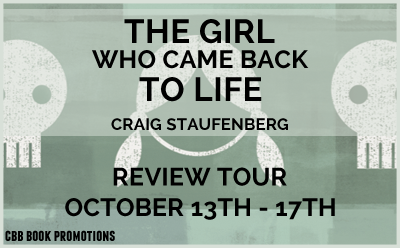 Craig Staufenberg is a writer and filmmaker living in NYC. Sophie, 12 years an orphan cones up with a plan... Bring her parents back to life. Sounds tough, but she is determined. She'll make the difficult journey to the north, but instead of Sending them off, she will remind them why they need to live. However, getting there will be more difficult than she thought and more eventful than she wanted. Still grieving her husband's death, Sophie's grandma accompanies her on the journey. That seems normal, except their relationship is anything but that... Together, they find their way north, but also find out more about each other and life than either anticipated. This book has several strong points. First, in the tradition of fairy tales, it imparts many lessons about family, death, grief, and acceptance. The pace of the adventure kept me intrigued. And as each new challenge was presented, a deeper level of understanding developed the characters. There was a subtly to this story that I really enjoyed. With any book though, I feel compelled to point out any issues that I, as a reader encountered. The story is told almost entirely in a narrative format rather than being immersed in dialogue or an active point of view. For younger and middle grade readers this is common, but I found myself longing for more. I also had some confusion at points over the main character. For being stripped from a loving home and deposited into a cold environment without help, or guidance, I felt Sophie remained too controlled... and a bit too mature for twelve. Neither of these deterred me from this enjoyable story. There are six races, four realms, and one human girl who can bring them together in peace...or war. Lilae has been hunted since the night of her birth. She is the only heir to the human god's throne. For centuries the races have been separated by an ancient barrier. Now that the barrier is crumbling and vanishing, the races are once again pitted against one another. Who will rule? Which races will survive? Will Lilae give up her chance for the throne to save the race of the man she loves? Even in the lowest levels of the Aurorian palace, where the servants slept, the castle staff sat up and listened to the queen’s cries of pain. No one wanted her to die. She was only the fourth queen of the Black Throne and yet she was the most loved. King Torek paced the dim, narrow corridor; the only light came from the brass torches placed against the stone walls. His brow furrowed as he waited for his summons. He wondered if it was wise of them to try for a second child. He was growing older and weaker. But one son wasn’t enough of a legacy for an Aurorian king. Torek had grown up with four brothers and seven sisters. It was a shame that he hadn’t sired more children in his long lifetime. King Torek had four wives and only one son. It was too late for doubts. They were twenty hours into labor and either the child would finally come or both the baby and the mother would die. King Torek finally sat down on the carpeted corridor’s floor in exhaustion. His legs were tired from standing. Sweat ran down his balding scalp. King Torek waved the young guard away as one last scream, more agonizing than the rest, broke him from his thoughts. The sound itself, in its clarity, sent a shiver up his spine. Torek drew a fearful breath and waited. His body was tense and rigid. After a few moments of complete silence, the short midwife opened the doors to Queen Sysil’s quarters and ushered him inside. The air inside the room was thick and steamy, the candlelight dim; it bathed the room in a faint orange glow. The smell of blood and sweat invaded his nostrils, so he covered his nose with his long velvet sleeve. King Torek noticed his young wife sprawled motionless on the bed. “Is she all right?” A look of worry creased his aging face. Queen Sysil’s eyes seemed sealed shut from tears of pain. Her scarlet hair was in disarray and sweat beaded her pale face. Her chest rose slightly and fell, and he sighed in relief. The midwife nodded. “She’s only resting.” Her aged eyes seemed to hold something more. “Where’s the child?” His dark eyes roamed the room. There were no screams or cries from the baby. The midwife pointed a chubby finger to the small bassinet at the queen’s bedside. The midwife’s aide stepped aside timidly, careful to avoid eye contact as the king towered over them on his path to the baby. If only they had time to try again. Sysil was only twenty-two, but Torek was nearly seventy, and his body reminded him of his mortality every day. Two children would have to do. “A baby girl?” To everyone’s surprise, Torek smiled. He looked in at the daughter who seemed so calm and peaceful. He picked her up, and his thoughts of having another boy vanished as he stared at her appealing, yet eerie beauty. The girl was tiny, with a head full of short, curly hair. It was odd; he’d never seen anyone with hair that shade of red before. It was so bright, that it seemed to have traces of gold throughout. The king’s body tensed as though under a spell, when his daughter looked up into his eyes. Under long, thick golden lashes were eyes of a rich, bluish green. He gasped, almost dropping her, when a faint flicker of light moved deeply within them. The child yawned so innocently, her little mouth opening in a perfect circle, before she closed her eyes to sleep. “She’s bewitched,” one of the attendants whispered. Torek turned and looked at the midwife; one of his bushy white eyebrows rose in search of answers. The queen’s attendants avoided his eyes as they busied themselves with cleaning the room of the blood-soaked rags. The babe did indeed resemble the queen as far as her hair color; however, her blue-green eyes were rare and unsettling. Though many humans of the North had special traits, there was something more to this girl. Torek already felt a deep love for the child, his baby girl. He gently hugged her close to him. “Let me hold her, your grace.” The midwife held her arms out, her small eyes never leaving the baby. “My king, what is wrong?” Sysil weakly tried to sit up in the bed. Her face paled even more when she saw Torek’s smile fade. The child’s eyes…did that thing again, flickering with light. Torek swallowed hard, fearing that something was wrong. He watched as the midwife examined the baby, the room full of tension. Heavy boots trampling down the corridor broke the silence. The door burst open and the captain of the palace guards, Pirin, charged into the room. Pirin pointed to the midwife. “Get the child from that woman! She is a witch.” Pirin looked to the king and spoke quickly. “We found the real midwife’s body in the stables.” He glared at the woman who stood there with the princess in her arms. There was a collective gasp from the aides. Torek’s heart raced as he watched the midwife transform to a woman of a younger age. He stepped back, startled. His jaw hung open as his eyes searched her face. Torek balled up his fists as the rage filled his veins. She did look evil with her black hair and pale skin. Her blue eyes looked at him without fear and that made his anger intensify. She stood there holding his beloved daughter. Delia shook her head, gripping the baby close to her chest. “I have not come to harm the child.” She raised a hand as if to calm them, meeting all of their eyes. “Seize her!” The soldiers charged for her. The calamity and uproar upset the wee princess, who wailed into the air. “Silence!” With a flick of her small hand, Delia seemed to rip their voices right from their throats. It was so sudden and immobilizing that no one could even scream. The room was flooded by light and all sound was sucked away. When she lowered her hand, everyone was frozen in place like statues. Delia slumped onto a chair, as though exhausted from her sudden burst of energy. She looked down at the child whose cry was the only sound heard in the room. She sighed and gently rubbed the girl’s tiny hand, as if to soothe her. Torek watched as Delia gazed into his daughter’s eyes. He saw the woman’s body shiver and knew that she, too, saw the light flicker there. The veins in Torek’s neck strained as he watched the woman cradling his daughter. Elder or not, he wanted to break free from the hold she had on all of them, and wring her neck. She reached inside her leather side-purse for a clear vial of blue liquid. When she opened the cask, a slight cloud of frost escaped. Torek watched as Delia drank a tiny sip; she squeezed her eyes shut and breathed deeply, as if waiting for something to happen. Finally, she stood. Delia was asking the impossible of Torak and Sysil; he wasn’t sure he could give up his newly born daughter, even if it was absolutely necessary. Delia released Pirin from his frozen state, and he fell to the floor. His hair was so blond that it was nearly white, and it fell into his eyes as he looked up at her. He winced as he began to move his limbs, as if shaking out pins and needles. He stretched his arms and picked up his sword. Torek looked around at the others, whose eyes were now glazed over; he sensed that they were no longer aware of what was occurring. Pirin stood there, as if unsure about what to do. He glanced at the king. Torek knew that if the Ancients, the creators of the races who populated the world, put their trust in this woman, then she must be an important person and one to listen to. The king tried to nod in Pirin’s direction, though he was still pinned still from Delia’s powers. “You are really an Elder?” Pirin remained calm, looking at the woman who claimed to once rule the Underworld. He glanced up at her. Pirin looked back at his men. They were still frozen. Pirin crossed the room and wiped the queen’s face. He leaned down and whispered something to her. Pirin unhooked Sysil’s silver necklace and balled it into his fist. “Very fitting.” Delia nodded, staring at the necklace for a moment before putting her hand across the baby’s face. Instantaneously, the little girl fell asleep. “Call me Delia, please,” she replied to Pirin. Delia pulled on her cloak and covered the girl’s head, holding her snuggly against her chest. She walked toward the door, but glanced back at Pirin, an eerie smile on her pale face. K.N. Lee is an award-winning author that resides in Charlotte, North Carolina. When she is not writing twisted sales, fantasy novels, and dark poetry, she does a great deal of traveling and promotes other authors. Wannabe rock-star, foreign language enthusiast, and anime geek, K.N. Lee also enjoys helping others reach their writing and publishing goals. Her works include, Rise of the Flame, The Chronicles of Koa: Netherworld, Dark Prophet, A Gifted Curse, Wicked Webs, Empty Your Heart, Pixie Dust, and the paranormal collection of short stories, Thicker Than Blood. Her short fantasy story, The Last of the Jinn, is in the anthology, A World of Worlds and The Ticking Ring is in A World of Joy by ASMSG authors. Author, K.N. Lee loves hearing from fans and readers. Connect with her!